Wavelength converters placement (WCP) in all-optical WDM networks belongs to the class of hard combinatorial optimization problems. So far, this problem has been solved by various heuristic strategies or by application of metaheuristic approaches such as genetic algorithms (GA), particle swarm optimization (PSO), differential evolution (DE), etc. In this paper, we introduce the application of Bee Colony Optimization (BCO) metaheuristic to solve the WCP problem in all-optical WDM networks. Numerous studies prove that BCO is a fast, robust and computationally efficient tool in tackling complex optimization problems. The objective of the proposed BCO-WCP algorithm is to find the best placement of limited number of wavelength converters in given optical network such that the overall network blocking probability is minimized. To evaluate the performances of the BCO-WCP algorithm, numerous simulation experiments have been performed over some realistic optical network examples. The blocking probability performance and computational complexity are compared with optimal solution obtained by exhaustive search (ES) approach as well as with DE and PSO metaheuristics. It will be shown that the BCO-WCP algorithm is not only be able to produce high quality (optimal) solution, but significantly outperforms the computational efficiency of other considered approaches. Luiz H. Bonani, Iguatemi E. Fonseca, "Estimating the blocking probability in wavelength-routed optical networks," Optical Switching and Networking, vol. 10, no. 4, pp. 430-438, 2013. A. Sridharan, K.N. Sivarajan, "Blocking in all-optical networks," IEEE/ACM Trans. Netw." vol.12, no. 2, pp. 384-397. 2004. A. Soares, J. Maranhao, W. Giozza, P. Cunha, "Cost benefit study of sparse-partial wavelength conversion architectures," in Proc. Int. Conf. on Systems and Networks Comm. 2006, ICSNC'06, vol. 12, 2006. S. Thiagarajan, A. K. Somani, "Optimal wavelength converter placement in arbitrary topology wavelength-routed networks," Computer Communications, vol.26, pp. 975-985, 2003. H.-Y. Jeong, S.-W. Seo, "A binary (0-1) linear program formulation for the placement of limited-range wavelength converters in wavelength-routed WDM networks," Journal on Lightwave Technology, vol. 23, no. 10, pp. 3076-3091, 2005. P. N Trian, U. Killat, "An Exact ILP Formulation for Optimal Wavelength Converter Usage and Placement in WDM Networks," in Proc. of IEEE GLOBECOM 2008, pp. 1-6, 2008. C. Fang, C. P. Low, "Optimal wavelength converter placement with guaranteed wavelength usage," in: Networking 2006, Lecture Notes in Computer Science, vol. 3976, pp. 1050-1061. 2006. L. Li, A.K. Somani, "Efficient algorithms for wavelength converter placement, "Optical Networking Magazine, vol.3, pp. 54-62, 2002. 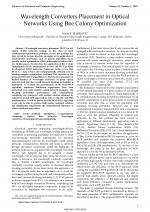 K. R. Venugopal, M. ShivaKumar, P. Sreenivasa, "A heuristic for placement of limited range wavelength converters in all-optical networks,"Computer Networks, vol. 35, no. 2-3, pp. 143-163, 2001. D. Zhemin, M. Hamdi, "On the management of wavelength converter allocation in WDM all-optical networks,"in Proc. of the IEEE GLOBECOM'03, vol. 5, pp. 2595-2600, 2003. A. S. Arora, S. Subramaniam, "Wavelength conversion placement in WDM mesh optical networks," Photonic Network Communications, vol. 4, no. 2, pp. 167-177, 2002. X. Chu, B. Li, I. Chlamtac, "Wavelength Converter Placement Under Different RWA Algorithms in Wavelength-Routed All-Optical Networks," IEEE Transactions on Communications, vol. 51, no.4, pp. 607-617, 2003. C. Vijayanand, M. S. Kumar, K. R. Venugopal, P. S. Kumar, "Converter placement in all-optical networks using genetic algorithms," Computer Communications, vol. 23, no. 13, pp. 1223-1234, 2000. K. Roy, M. K. Naskar, "Genetic evolutionary algorithm for optimal allocation of wavelength converters in WDM optical networks," Photonic Network Communications, vol. 16, no.1, pp. 31-42, 2008. N. Sengezer, E. Karasan, "Tabu search algorithm for sparse placement of wavelength converters in optical networks," Lecture Notes in Computer Science - Comp. and Inform. Science ISCIS'04, vol. 3280, pp. 247-256, 2004. C. Teo, Y.C. Foo, S. Chien, A. Low, "A. You and G. Castanon, Wavelength converters placement in all optical networks using particle swarm optimization," Photonic Network Communications, vol. 10, no. 1, pp. 23-37, 2005. F. Lezama, G. Castanon, A. M. Sarmiento, "Differential evolution optimization applied to the wavelength converters placement problem in all optical networks," Computer Networks, vol. 56, no.9, pp. 2262-2275, 2012. 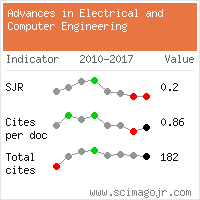 J. Shen, J. Chien, "An Improved ACO Based RWA Algorithm and Its Application in Wavelength Converter Allocation Issue of the Intelligent Optical Networks," Journal of Computational Information Systems, vol.10, no.8, pp. 3341-3349, 2014. Diego P. Pinto-Roa, Carlos A. Brizuela, Benjamín Barán, "Multi-objective routing and wavelength converter allocation under uncertain traffic," Optical Switching and Networking, vol. 16, pp. 1-20, 2015. T. Davidovic, D. Teodorovic, M. Selmic, Bee Colony Optimization Part I: The Algorithm Overview, Yugoslav Journal of Operations Research, vol. 25, pp. 33-56, 2015. D. Teodorovic, M. Selmic, T. Davidovic, "Bee Colony Optimization Part II: The Application Survey," Yugoslav Journal of Operations Research, vol.25, no.2, pp.185-219, 2015. G. Markovic, D. Teodorovic, V. Acimovic-Raspopovic, "Routing and Wavelength Assignment in All-Optical Networks Based on the Bee Colony Optimization," AI Communications, vol.20, no.4. pp. 273-285, 2007. G. Markovic, V. Acimovic-Raspopovic, V. Radojicic, "A heuristic algorithm for lightpath scheduling in next-generation WDM optical networks," Photonic Network Communications, vol. 23, no.3, pp. 272-284, 2012. Citations for references updated on 2019-04-23 06:10 in 144 seconds. Website conception, design and maintenance by Eugen COCA. Content updated on 28 Feb 2019. Site engine updated on 28 Feb 2019. This page was generated on the server in 0.066 seconds and loaded in your browser in > seconds.